The sweeping grasslands of the Eastern Cape are rich in history and culture. Once home to many of the Eastern Cape’s first settlers, this frontier country is again home to thousands of animals including lion, black and white rhino, buffalo and elephants which roam freely through the reserve. Kwandwe’s 22 000 hectare Private Game Reserve is located in the Great Fish River region and is the perfect gateway to or exit point from tours along the Garden Route. This malaria-free reserve has two sole-use villas – Uplands Homestead and Melton Manor and two communal lodges Kwandwe Great Fish River Lodge and Kwandwe Ecca Lodge. 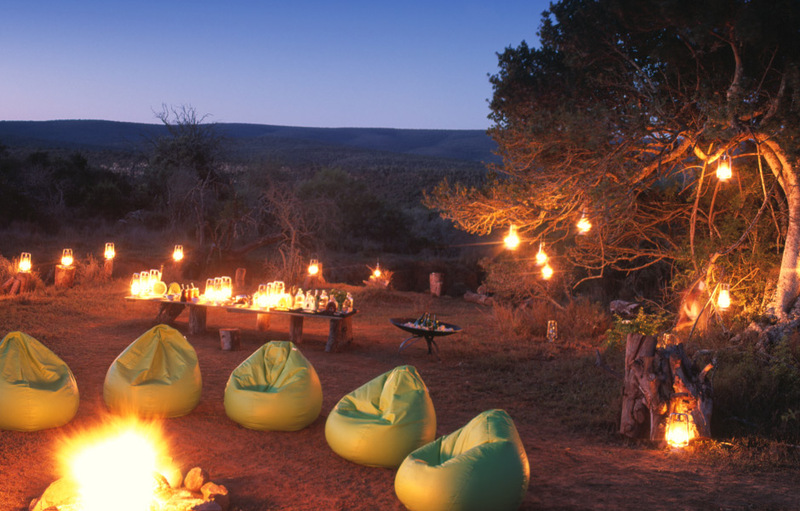 Kwandwe Ecca Lodge is not your typical bushveld lodge. The external architecture is an eclectic mix of Australian Outback and a little Balinese. Inside, the Lodge is decorated in vibrant hues of avocado, cerulean blue, citron, olive, tangerine and tiger lily – a refreshing modern take on retro 70’s chic. It has a youthful exuberance and just a touch of quirky irreverence. Mesh-covered stone gabions are juxtaposed to brightly painted walls throughout the lodge. 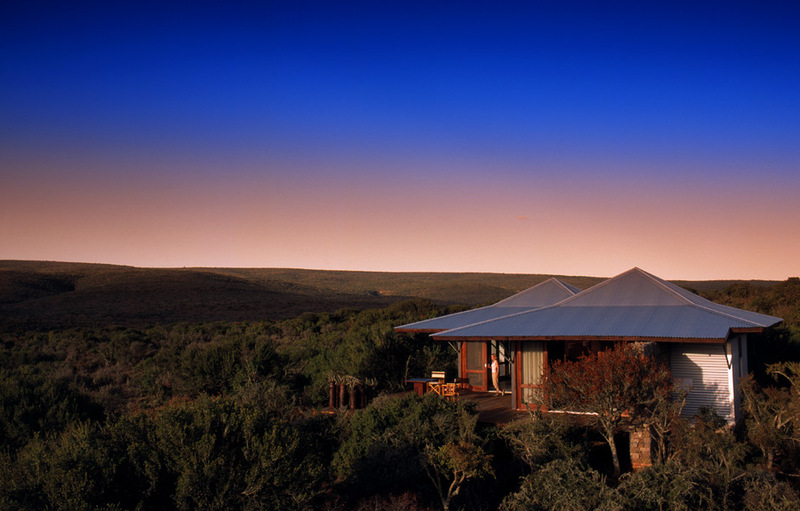 Ecca Lodge has six spacious suites decorated in natural textures in hues of burnt orange, rust and olive. The stylish en-suite bathrooms include an indoor and outdoor shower, luxurious oversized baths, twin hand basins and a separate toilet. Each suite has a contemporary sitting area, large veranda and private deck with a plunge pool. 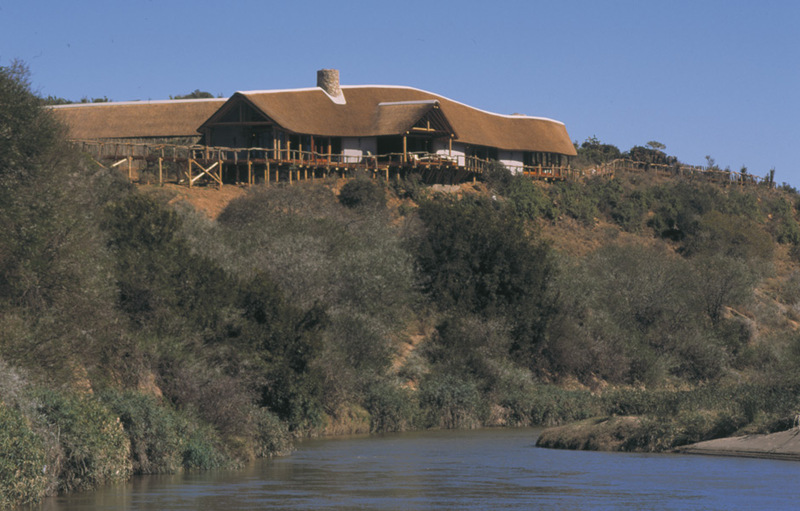 Great Fish River Lodge’s frontier style is reflected in the stone walls, thatch roofs and long wooden walkways. The architecture and decor are more traditionalist and rugged – a reflection of this lodge’s surroundings. Decorated with gleaming antiques, warm rugs and huge fireplaces, the Great Fish River Lodge calls to mind a more sedate and gentile era. 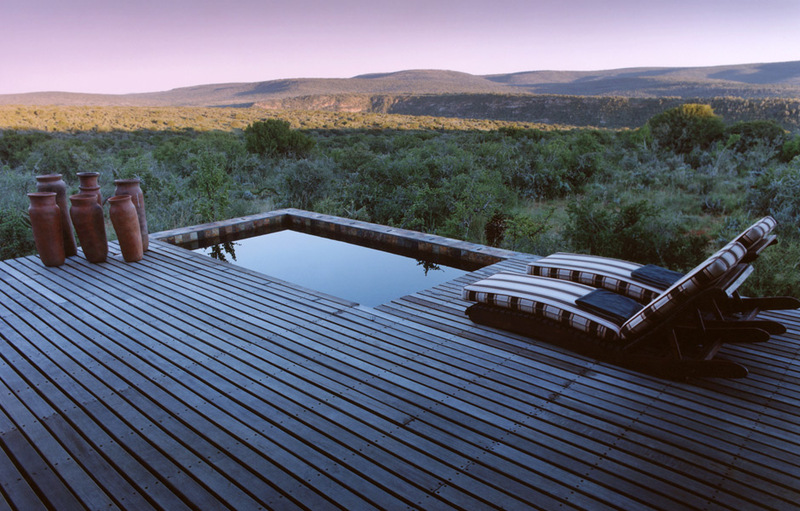 Generous viewing decks allow for lazy days, watching the bountiful wildlife as it makes its way across the reserve to the water’s edge. There are nine splendid suites at the lodge, each offering spectacular views through the floor to ceiling glass doors. 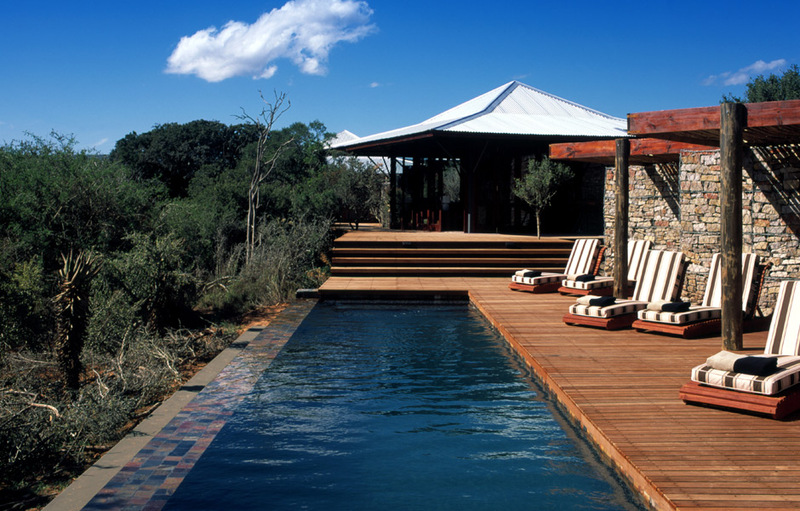 African-inspired earth-toned decor compliments the bushveld surroundings. Like Ecca Lodge, every en-suite bathroom has an indoor and outdoor shower, twin basins and separate toilets. Here even the roll-top baths have glorious views across the Great Fish River. Each of the suites has its own covered veranda and a private deck with exclusive splash pool. The only way to truly experience the majesty of the African bushveld is from the comfort and privacy of your own personal safari vehicle with your own tracker and ranger. When you stay at Kwandwe’s sole-use safari villa - Melton Manor that’s exactly what you’ll experience. Melton Manor is a contemporary, u-shaped Frontier farmhouse. This spacious lodge has wonderful high ceilings and deep cool verandas overlooking the central courtyard and its large swimming pool. The Manor has four luxuriously appointed en-suite bedrooms with innovative “butler hatches” for discreet room service. There is a definite sense of whimsy at the lodge and it’s the perfect place to relax in the deep sofas, wrapped in a brightly coloured crocheted blanket while you read a good book in front of a roaring fire. Here, mid 20th century furniture is effectively combined with the latest in South African design. In traditional farmhouses, the kitchen is the heart of the home and it’s no different at Melton Manor. 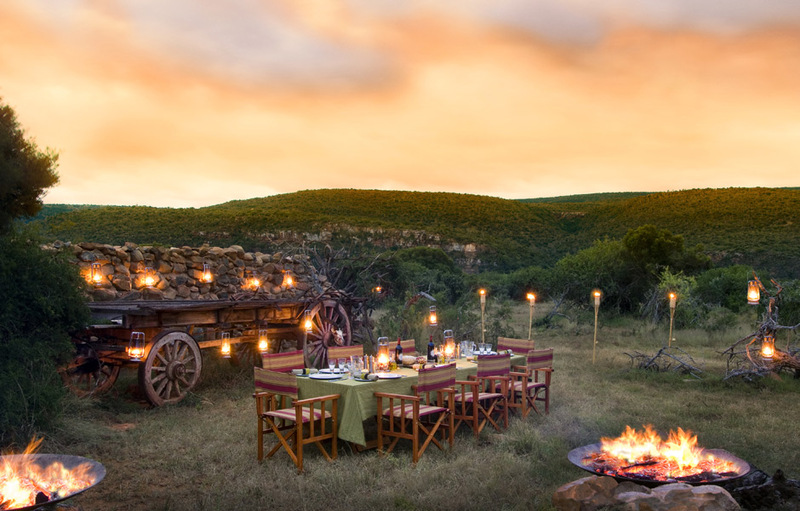 Guests can enjoy their meals at the dining room table, or around the enormous farmhouse table where they can interact with the personal chef and learn some of the secrets of traditional South African faire. Built in 1905 Kwandwe’s Uplands Homestead is a beautifully restored farmhouse furnished in 1820’s Settler style. The sole-use Homestead has three spacious bedrooms with en-suite bathrooms and private verandas. Situated in a remote and tranquil valley surrounded by lush undulating hills, Uplands Homestead is full of charm and romance. Interiors are elegant and refined in contrast to the untamed wilderness outside. Here too, the kitchen is the heart of the home, and your personal chef creates mouth-watering new and traditional dishes. In the lounge, comfortable chairs and sofas are ideal for some quiet relaxation. Each of the spacious and luxurious 1820 Settler inspired bedrooms are furnished in yellowwood, have beautifully appointed en-suite bathrooms – two with antique ball and claw baths and the other with an oversized oval stone bath. As with Melton Manor, guests here will also enjoy the luxury of their own dedicated 4x4 safari vehicle, tracker and ranger.